Given an array of meeting time intervals consisting of start and end times [[s1,e1],[s2,e2],...] find the minimum number of conference rooms required. The basic idea of the solution is that we sequentially assign meeting to a room. We use a min heap to track the earliest ending meeting. Whenever an old meeting ends before a new meeting starts, we remove the old meeting. Otherwise, we need an extra room. There was a discussion in the comment about why a regular queue is not good enough. 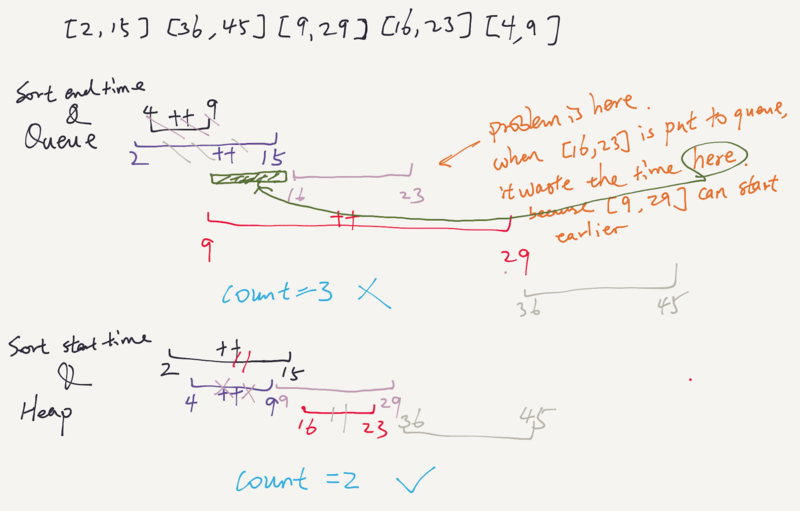 I draw an example below to show why sorting based on start time and using a priority queue is necessary. then 11-13 is added to priority queue..
then 11-13 is compared with 14-17… count is NOT incremented. Instead of Priority Queue take simple queue to store elements but just sort by endTime .